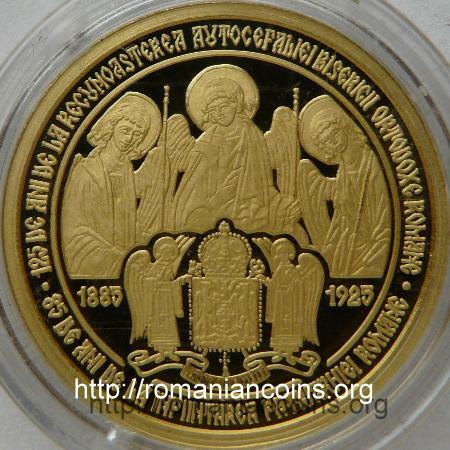 Obverse: ROMANIA, face value "200 LEI", coat of arms of Romania, year 2010, interrupted inner linear circle, the Patriarchal Cathedral Reverse: inner linear circle, a fragment from the icon of Holy Trinity, in the lower part the coat of arms of the Romanian Patriarchate and years 1885 and 1925; circular inscriptions "· 125 DE ANI DE LA RECUNOASTEREA AUTOCEFALIEI BISERICII ORTODOXE ROMANE" meaning "125 YEARS SINCE THE ACKNOWLEDGEMENT OF THE AUTOCEPHALY OF THE ORTHODOX CHURCH OF ROMANIA" and "85 DE ANI DE LA INFIINTAREA PATRIARHIEI ROMANE ·" meaning "85 YEARS FROM THE ESTABLISHMENT OF THE ROMANIAN PATRIARCHY"
Year 2010 was proclaimed by the Romanian Orthodox Church as "Anniversary Year of the Orthodox Creed and of Romanian Autocephaly". Year 2010 celebrated 125 years of autocephaly of the Romanian Orthodox Church (on April 25th 1885 the ecumenical patriarch Ioachim IV of Constantinople gave a "tomos" of acknowledgement) and 85 years since the elevation of the Romanian Orthodox Church to the rank of Patriarchate (in 1925 the Holy Synod decided to establish the Romanian Patriarchate, and raised the metropolitan primate to the rank of patriarch). Tomos means volume or tome, and an autocephalous church is not subordinate to any other church. The Patriarchal Cathedral is a very old church. 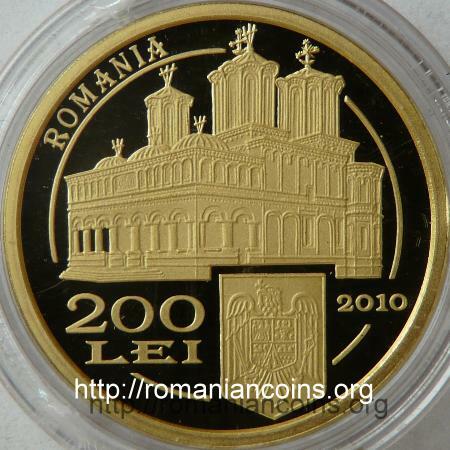 In 2006, at the 350th anniversary of the church establishment, the National Bank of Romania issued a 500 lei gold coin, on which this church is also represented.